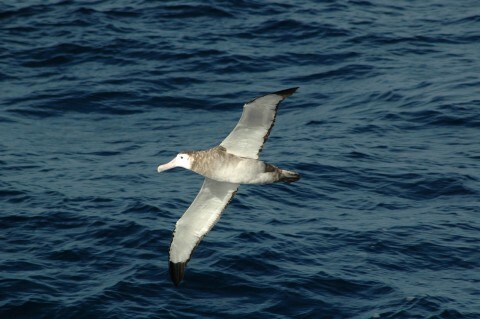 Albatrosses are one of the most inspiring of marine creatures, gliding effortlessly on huge broad wings across the oceans. They have the longest wingspan of any bird. Perhaps we humans envy them, just a bit, for their apparent freedom to fly across the oceans anywhere that takes their fancy, only returning to land every two years. I say ‘apparently’ because of course they must go where the food is and for antipodean albatrosses that now means sometimes flying as far as South America to find food. Climate change impacts in the marine environment may well be affecting their food supply which means raising a chick even for two hard-working parents is becoming increasingly difficult. This magnificent albatross breeds mainly on the Antipodes Islands south of New Zealand but a few pairs breed on Campbell Island and the Chatham Islands. Here, I am separating the Antipodean albatross from the closely related Gibson’s albatross which breeds on the Auckland Islands. Currently they are classified as subspecies, but because they breed on different islands and feed in different areas. From a conservation perspective they should be treated as separate, as they face different threats. In our New Zealand classification of the conservation status of birds, they are both considered to be critically endangered. That’s serious! Next step is extinction. Fifteen of the 22 species of albatross worldwide are considered to be threatened and globally they are the most at-risk bird group. Like all albatrosses they spend many years finding just the right mate so don’t start breeding until they are at least seven years old. They need plenty of time to get to know each other and make sure they are compatible. After all, raising a chick takes months of dedicated work by both parents and you need to make sure your partner will be as committed as you are. Sadly the population on the Antipodes is declining – females even faster than males so it’s hard to find a new girlfriend if your mate dies. Fisheries bycatch and changes in their marine environment are the main threats to their survival. This video of an Antipodean albatross was taken by albatross researcher and enthusiast Kath Walker on one of her yearly visits to study these birds. Meeting an albatross up close is one of the best experiences, if you want to see an albatross here is a link to a tour you can do off Kaikoura.